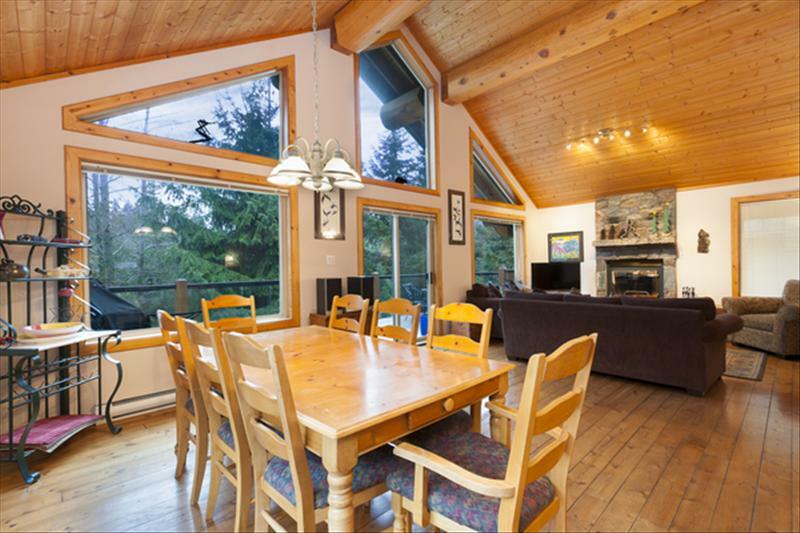 Vaulted dining room ceilings, log beams, big windows. 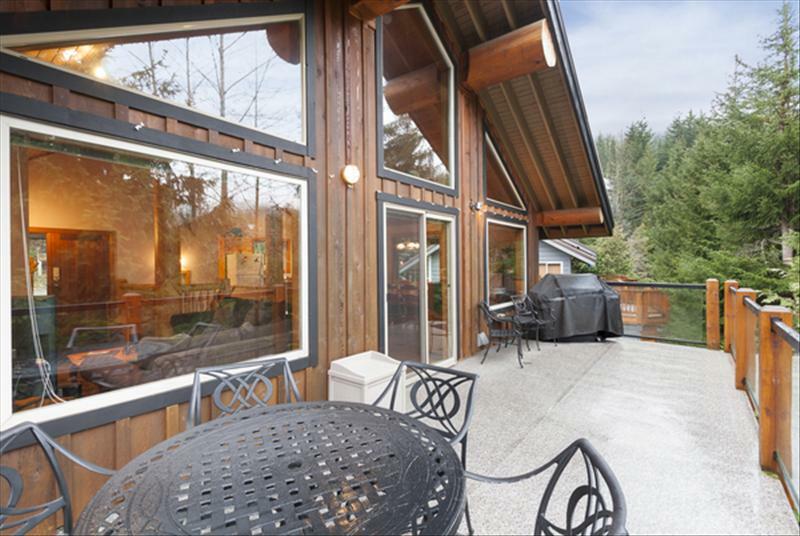 This spacious 2 level home with pine posts & beams has hardwood flooring on the main floor, is newly furnished, well appointed and is located in Whistler Creekside. 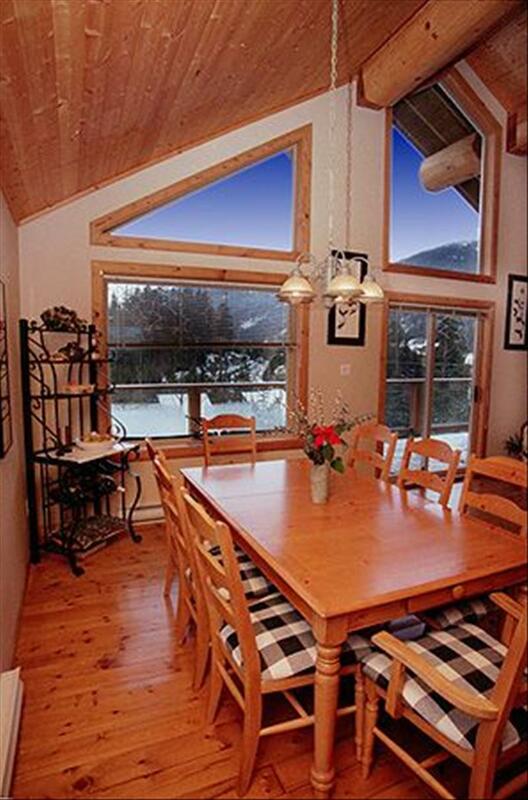 It is only a 3 minute drive or a 12 minute walk to Whistler Creekside Gondola. 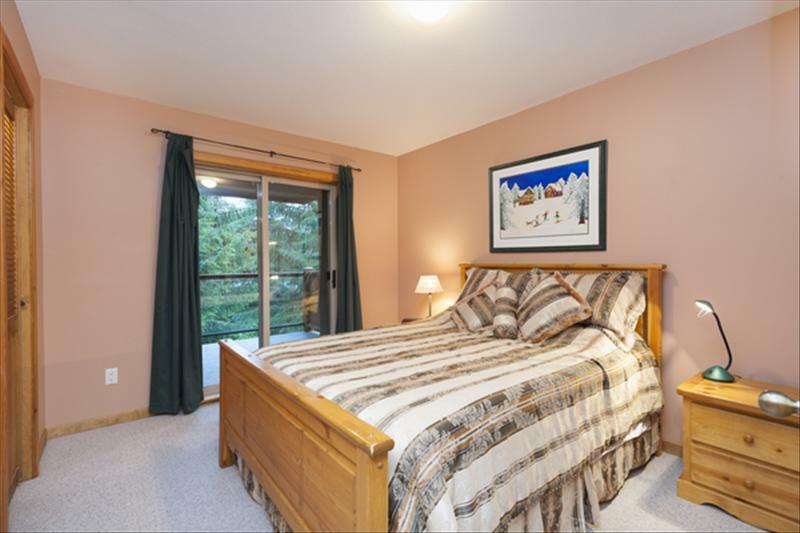 It is less than 10 minutes drive to Whistler Village/Blackcomb ski lifts. 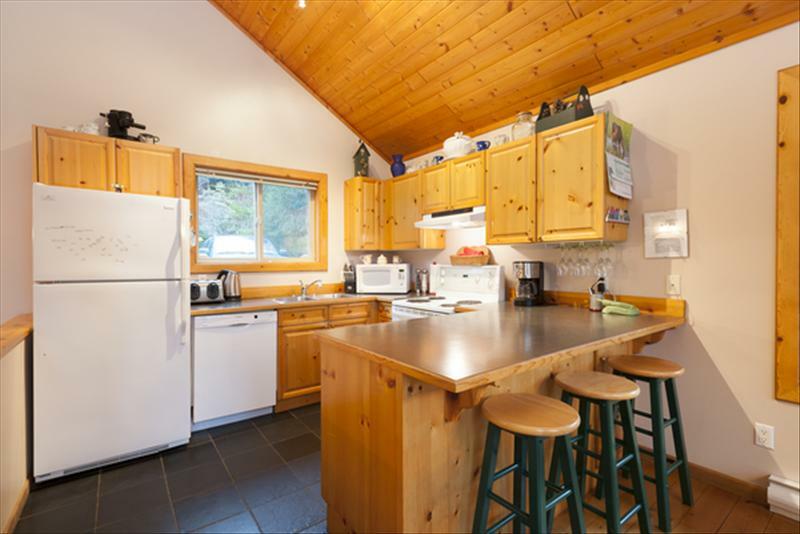 The chalet features: 3 Bedrooms, 2 Bathrooms, 2 large Decks, Wood Burning Fireplace, BBQ, Washer and Dryer, Ski/bike storage, 2 TVs, Stereo, & Wireless Internet. Housekeeping and laundry services are included with the minimum stay. 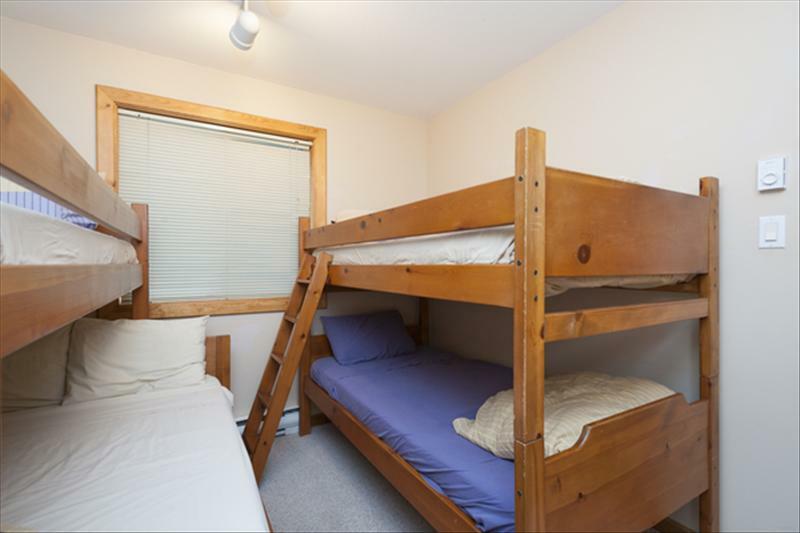 Sleeping layout is as follows (sleeps 8): 1 Queen in the Master Bedroom, 1 Queen in the 2nd Bedroom, and a Double/twin bunk bed (double on bottom/twin on top) in the 3rd bedroom. Parking is available for 2-3 cars directly in front of cabin or there is local bus service to the lifts and/or main village. 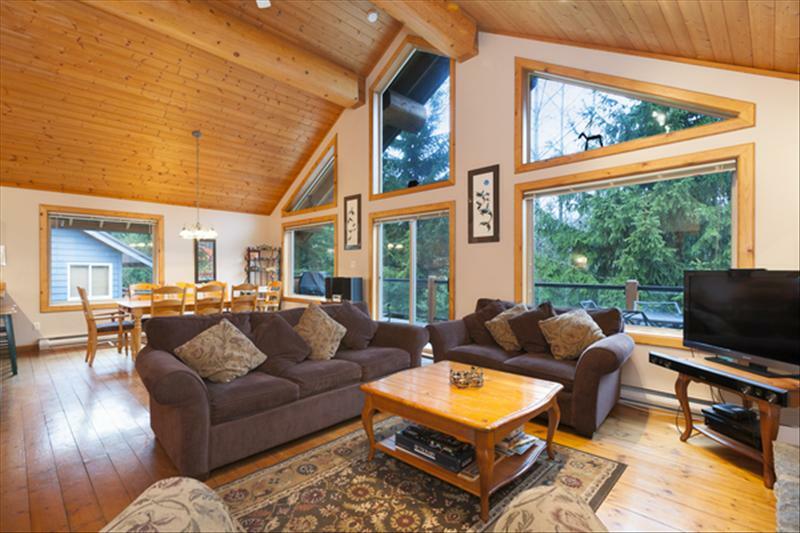 Testimonial: "Your place in Whistler is gorgeous. Our group loved the layout, location and hospitality for our long term stay. It is by far one of the best places around. 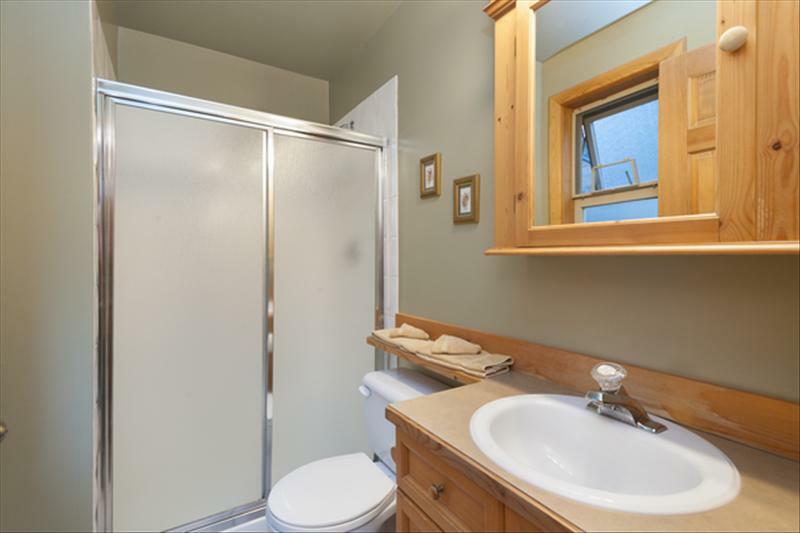 You have made it feel like a home, yet kept that wonderful cabin feel. Thanks so much for everything." If you require more information or are interested in booking, please contact owner via email or phone 604-306-7214. Cancellation Policy: 25% Deposit upon booking- Deposit is kept if cancellation less than 60 days before stay. Open living space with natural light and real wood. 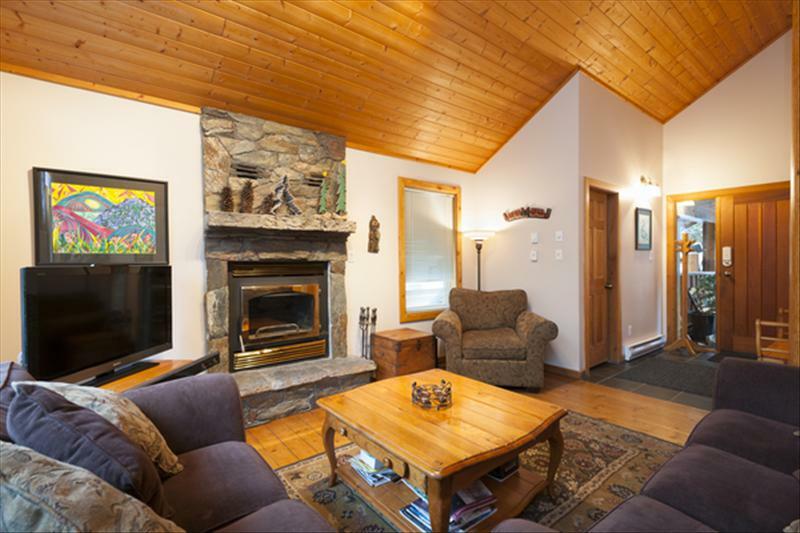 Enjoy our warm and comfortable living room. 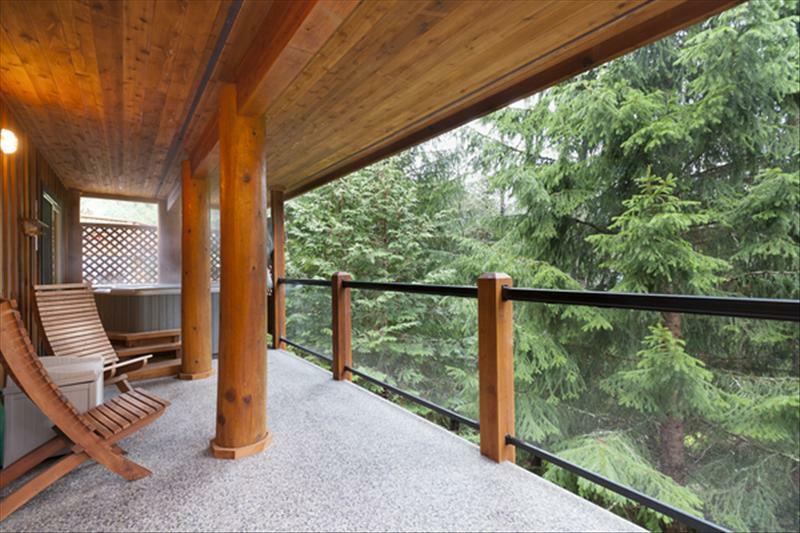 Private outdoor hot tub on the deck. 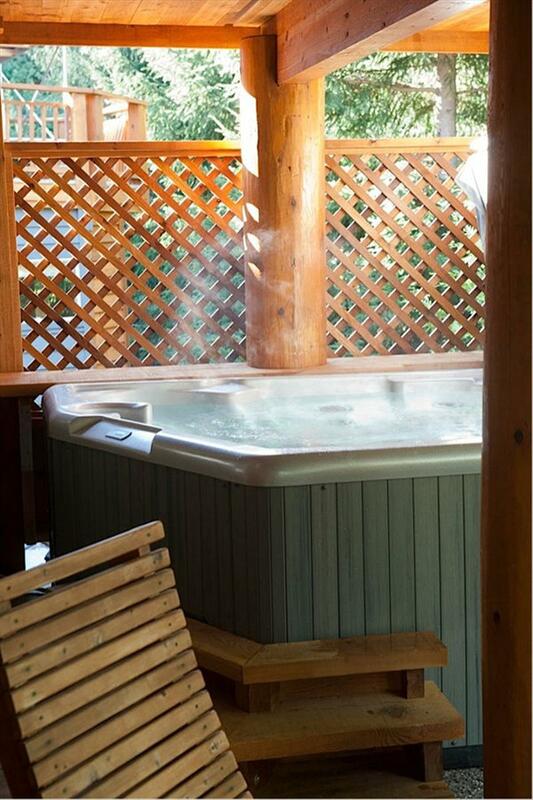 Relax in Creekside Chalet private hot tub. 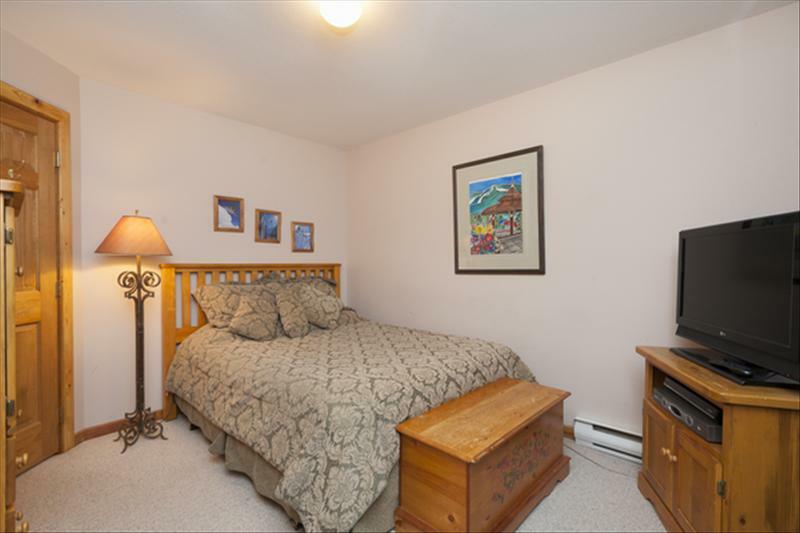 1 Queen bed in 2nd bedroom. 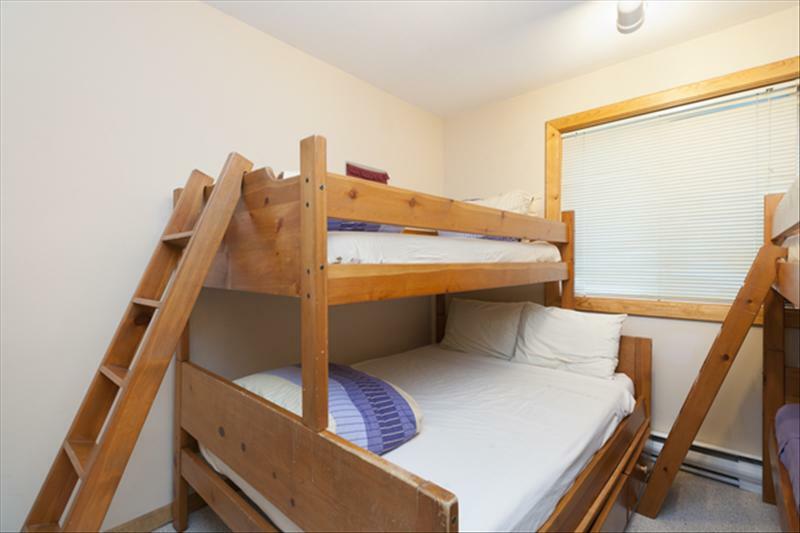 Bunk Room-2 sets of bunkbeds (1 with double) in 3rd bedroom.